Black and white photograph of Lucie Rie's vase (Crafts Council Collection: P104) with overlaid transparency showing formatting notes. Attached to the reverse of the photograph is information regarding the 'Ten British Potters' exhibition, in which this work was included. 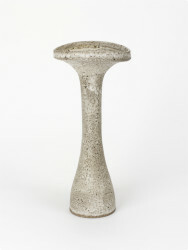 Photography, 'Vase' by Lucie Rie, photographer Geremy Butler, c.1972. Crafts Council Collection: AM225.